Insert a new worksheet (you're going to use this only for printing). Do this for each area you want to print on the same page, the areas don’t have to be on the same sheet. If you change the original range, the picture will change too (values and formatting!). You can always use this sheet to print because it will always update if you change the original data. Go to the new worksheet and with the Shift key pressed click on Edit | Paste Picture Link. Go back and do the same for the other areas. Note: You see that the edit menu will change when you press the shift button when you click on Edit. 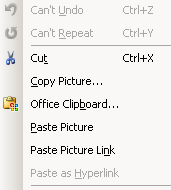 Excel 2010-2013: Choose the Linked picture button. The macro will add a new sheet and copy all the selection areas on it. Then it will print and delete the sheet. You can also enter the more areas range in the code if you want.